Third Time Lucky edged out Master of the World in a photo finish to win the Cambridgeshire Handicap at Newmarket. The pair battled it out on the far side of the 34-strong field, with 14-1 shot Third Time Lucky edging home under jockey Adam Beschizza. The victory completed a notable double for trainer Richard Fahey, who won last week's Ayr Gold Cup with Don't Touch. Master of the World, at 25-1, lost by a short head, with Examiner (50-1) third and Man Of Harlech (20-1) fourth. "As a jockey you always know in the back of my mind whether you've got it," said Beschizza, who was celebrating the biggest win of his career. "I thought I just had by a fraction. He's only small, but he's very honest. He goes on all sorts of ground, today was probably on the quick side of good but he's a relentless galloper. " Shalaa won the Middle Park Stakes for trainer John Gosden and was hailed as the "best two year-old I've ridden" by jockey Frankie Dettori. 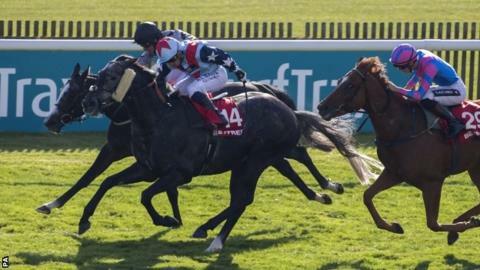 Gosden and Dettori also savoured victory in the Royal Lodge Stakes with Foundation, who could ne aimed at next year's Derby at Epsom.